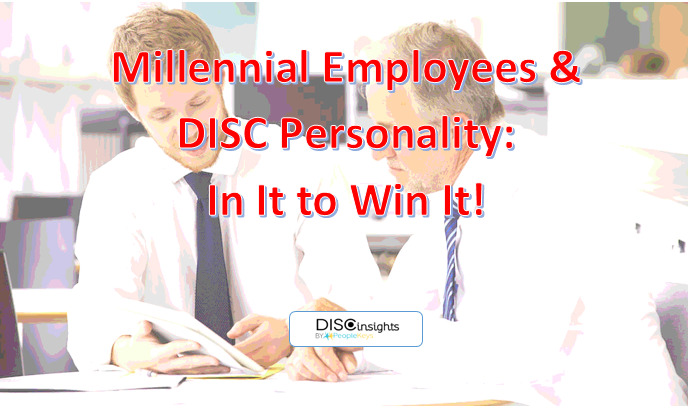 Millennial employees and DISC Personality: In It to Win It! “I’m in it to win it!” Jay told me during his interview. “I’m in this for the long haul, and I know it takes a lot of hard work and perseverance!” He added, “That’s why I want to give you a 6 month commitment to see what happens at the company and where my future is at that time.” 3 months into his 6-month strategy, Jay ended up moving across the country. To a “Baby Boomer” manager like myself, this is almost considered treason! We Boomers believe that 6 months is just getting started, while a “long-term commitment” is 5 years or more. After all, we were raised that way. To a highly skilled “Millennial” though, it is not about longevity but instead about opportunity within a dynamic, changing workplace that is willing to provide bonuses and other incentives to attract great talent. Jay, a fictional character based on an actual experience, shared characteristics not uncommon to Millennials today. The good news is, because here at PeopleKeys we practice what we preach and use our own tools: D4 Hiring and Benchmarks. We knew ahead of time that Jay’s quick departure to something bigger and better could be a possible outcome. He was a highly interactive “I” personality style, Theoretical Team Thinking Style - TEAMS, and had high Personal Freedom - Workplace Values, with a passion for Artistic Creativity - BAI. He was put in a position to develop new business initiatives (through technology, etc.) which could easily be taken over by someone else if he departed. He paid for himself through the new business he helped us develop and we wish him the best. As a “Baby Boomer,” I was told to work hard, prove myself, and then maybe (after a few years) the company would recognize my worth and promote me to more responsibility. That was 30 years ago and the strategy worked well for me. Of course, that was during a time when you could count on staying at one place for most, if not all, of your life. I only changed jobs, or careers, three times and once was because I had sold a company I started. “Millennials” and those born after the Baby Boomer generation, face an entirely different set of circumstances. Companies today, in general, are not as loyal to employees as they once were. The expansion of the internet and digital technology has allowed companies to outsource more, as well as come up with other alternatives to making hiring commitments with good benefits. So, while Boomers might want to blame the Millennial generation, aren’t we partly responsible for creating an environment in which they feel options must be kept open? I think this debate will never really be resolved. It’s like the old adage, “What came first…The chicken or the egg?” (Personally I think the chicken…LOL) Rather than debating or arguing over these points, why don’t we just try and understand one another, and agree there are differences? We at PeopleKeys always say, “Behaviors are different, yet they are predictable.” We like to think our Predictive Hiring tools are the best and first on the market, as they assess over 1,440 points in which we differ as individuals. If you want to be precise, every human is uniquely different (even identical twins often have different personalities), but we have pinpointed 1,440 characteristics that definitively predict success and happiness within the workplace. Are you the Boomer or the Millennial? What are your thoughts? We love to hear productive feedback that can enhance our own team effort to making sure we have the best and most user friendly products and services! Email us your thoughts at sales@peoplekeys.com!